The GS™-4047 full drive-height electric scissor lift, with a working height of almost 14 m and width of just 1.19 m, is suited to narrow spaces with high ceilings, such as industrial applications, while also offering big performance. With a 25% gradeability, up to 8 hour of battery life and lift capacity of up to 350 kg (770 lbs) it is an excellent edition to any rental fleet or maintenance operation. The new GS-4047 scissor lift will provide operator confidence and capability while working at full height, with a solid, durable construction and zero inside turning radius. 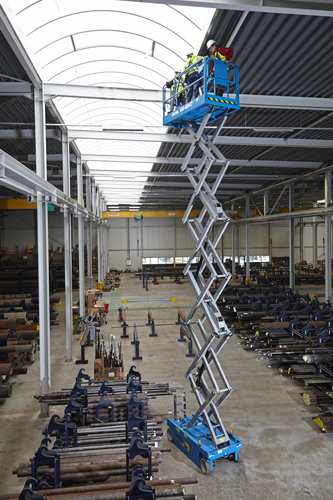 The responsive four-wheel braking system of the GS-4047 scissor lift and its rigidity will help increase operator confidence when working at full height from a 3-person platform. Dual front-wheel drive and zero inside turning radius, combined with a compact footprint of just 2.44 m (8 ft) long and 1.19 m (3 ft 11 in) wide stowed, makes the GS-4047 scissor lift ideal for manoeuvring around tight restrictive work environments. A 91 cm (3 ft) extension deck allows workers and tools to utilize the maximum amount of platform space. 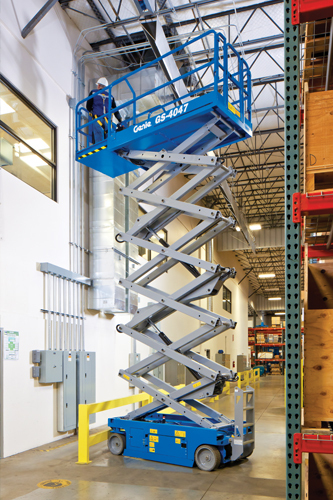 The GS-4047 scissor lift incorporates the SmartLink™ control system which allows for improved troubleshooting with new grouped fault codes, easier battery charge detection and user-friendly machine adjustments. 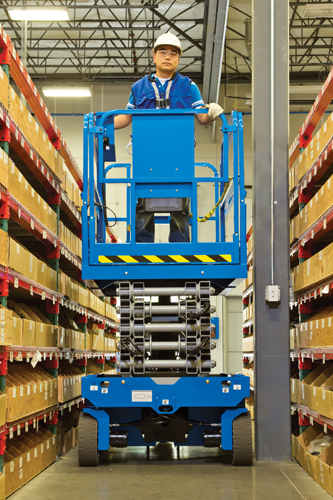 Other maintenance features of the GS-4047 scissor lift include hoses and wires that are accessible without the need to stretch the stack and slide-out battery trays.